Bangkok (Thailand) – June 5, 2018 (travelindex.com) – R.HAAN, Bangkok’s newest fine dining spot from ‘Todd’ Piti Bhirombhakdi and Chef Chumpon Jangprai, has welcomed Mr. Santi and Ms. Aruni Bhirombhakdi, Mr.Bhurit and Ms.Nisamanee Bhirombhakdi, Ms. Preerati Bhirombhakdi, Ms. Woranuch Bhirombhakdi, other esteemed guests and medias from the dining industry for its grand opening on May 23, 2018 at Thonglor Soi 9. Guests have been served to Thai seasonal food mainly made from natural ingredients which reflects Thai’s abundant resources. The name “R.HAAN” also comes from the direct pronunciation of the word ‘food’ in Thai which is the core of our living. In addition to the ingredients picked exclusively from Thailand, the art of culinary that was put into the cooking process is also portrayed by the head chef who is immensely experienced in Thai culinary which will create an unforgettable dining experience for those who have visited here. 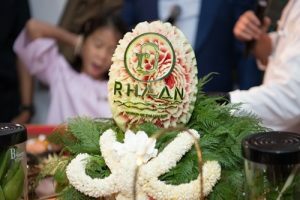 “R.HANN” will focus on delivering authentic Thainess through local culinary, art and culture for everyone to fully immerse themselves in Thai culture. 1. INGREDIENTS: A home to vast Thai cuisine ingredients such as Bang Pakong sea bass, Pak Naam Bang Ta Boon blue crab, Kam Pang San special fed Thai beef, Ratchaburi chilli and Steamed Hom Mali rice from Chiangrai and Ubon Ratchathani, which will delight those who cook and those who have eaten them. 2. SEASONING: Thai cuisine has always been known for its extreme yet delicate flavors. R.HANN brings you Thai seasonal food, summer, rainy and winter, which will be changed according to the Emerald Buddha’s royal cloth-changing event. This tells the story of how food, time and seasons shaped our Thai’s happiness throughout the ages. 3. HEATING: The element that combines everything to come together and become a splendid dish. 4. BALANCING: The 5 tastes; sweet, oily, salty, spicy and bitter at the taste tip, completes the real Thai taste. Each flavor needs delicate and experienced hands to fully understand and manipulate them masterfully. 5. PASSION: Displayed through the plates and silverwares hand drawn by highly skilled craftsmen, resembling the ones used in the palace back in Rattanakosin era. You can also feel the passion flows in the decorations, staffs and every elements in the restaurant that want you to enjoy the best Thai food at the best Thai restaurant.